This large and elegant yacht will take you to beautiful destinations along the Adriatic coast, across its five decks there is only the most comfortable and relaxing time to be had. 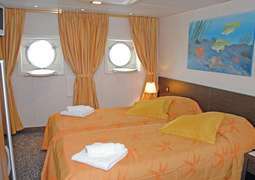 The accommodation on board the Belle de L’Adriatique consist of outside cabins which are between 12 and 15m2 in size and contain furnishings in warm colours. There is either a large panoramic window or porthole which allows natural light to filter into the cabins and give you a fantastic view outside. Aboard this ship you will always be provided with the most delicious and nutritious meals throughout your journey. You can start your day with a breakfast buffet and then for lunch and dinner you can look forward to a multi-course menu of the best food from European cuisine as well as local specialties. Drinks such as water, juice, tea, coffee, beer and a selection of wines are all available to complement your meals. The piano bar provides a fantastic place to enjoy yourself at the end of the day with a nice drink. The welcoming lounge has a dance floor and bar, and is a place for special events. Those wanting a bit more of a peaceful time can visit the reading corner and read a good book, and to escape the hubbub of the rest of the ship. The partially sheltered Sun deck has comfortable deck chairs where you can relax and soak up some rays. To keep fit there are much exercise equipment on board which you can use so there is no need to neglect your fitness routine. Before you leave ensure that you visit the boutique and purchase a small souvenir either for yourself or those back home. As there is a relaxed atmosphere on board the Belle de L’Adriatique, it is recommended that you wear casual clothing for the most part but for formal evenings such as the Captain’s dinner it is more appropriate to wear formal attire.